I’m sitting in the library uploading business card orders to my printer and waiting on a meeting with another local businessman. It’s been one year and one week since Virginia passed due to complications from breast cancer. A lot has changed. I’ve chronicled most of my changes here and I don’t really feel the need to rehash. I spent most of the day May 12th crying over Virginia. The wounds are still there, though with the passage of time they hurt less. I wouldn’t have been able to make it through the day without Ashya. It’s been a frustrating year as I’ve been looking for work since September of 2010 when I got laid off. It gets very frustrating to hear potential employers tell me that they’d love to hire me but won’t because I have too much experience. I’m in my 40s with a wife and 5 kids to take care of, don’t tell me that I’ve got too much experience for the job. I explored the option of going back to school but ultimately didn’t because my former employer keeps forgetting to send me a written notification of being laid off (a necessary prerequisite to getting funding). I’ve taken tests to see if there’s another career option that I’m suited for, nope I’m uniquely suited to do what I’m doing. I finally went out and started up my own business and much to my surprise (but not my wife’s), the business is taking off with a sudden burst. www.aliengraphicsnow.com I’m excited about the prospects. However, I realize that I’m where I need to be. God called Virginia home. God sent Ashya to me when I needed her. God has not let us go hungry, without shelter, and has kept our gas tanks full. One Year Later, and I’m finally realizing what it means to let God be in control. 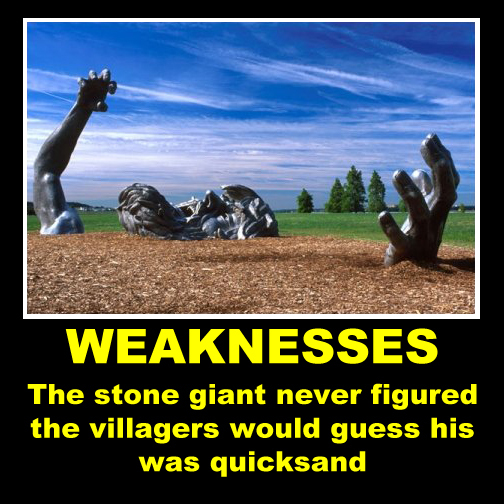 Sometimes, your weaknesses are more apparent to others than to ourselves.